Warning: What follows is quite dorktacular. You have been warned. 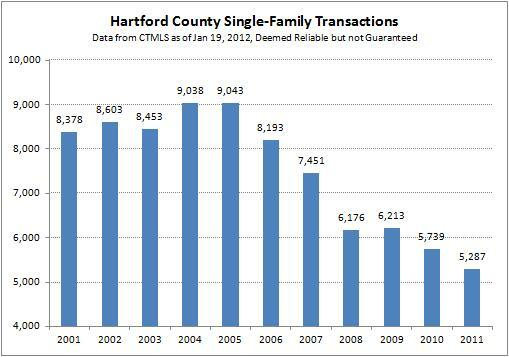 Last week we looked at the really big picture transactions data for Hartford County in 2011. The main concern we had with how the numbers turned out was that the average single-family home price appeared to rise slightly from 2010 to 2011, which was not what we saw in the market on a house by house basis. There is no easy way to track the price trends in a region because every house is unique. Repeat sales is the best method I know of, but it’s too hard for us to use. Anyway, we were talking averages in the post. Our hypothesis as to why the average might be misleading in this case is that averages can be influenced by a change in the mix of homes that sold between the two years. They are especially susceptible to sales of expensive homes since one million dollar property contributes as much to the total sales volume as five $200,000 homes. The first step we took to test our hypothesis was to look at how the mix of sales changed between the two years. The chart shows that the number of sales increased in the sub-$100,000 price band and also in all three price bands above $500,000. It also shows that the $100,000s remained almost exactly the same. Finally, the number of deals in the $200,000s fell by about 20%, while both the $300,000s and $400,000s fell by about 12%. The chart confirms our anecdotal observation that there is was more interest in high end properties in 2011, but doesn’t address our hypothesis in a convincing manner. What if we plotted the total sales volume for each price band instead of the number of deals? That would put each of the price points on equal footing in terms of their contribution to the average. 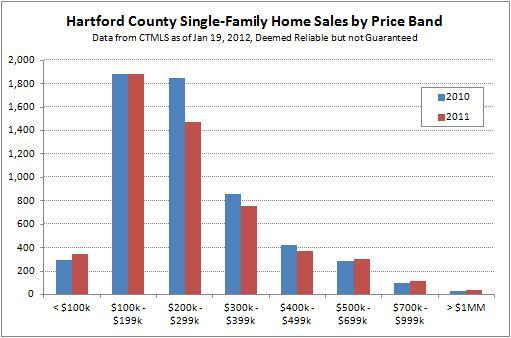 This chart shows that the homes that sold for less than $100,000 matter very little in the average. But otherwise the chart is not conclusive about whether the average remained the same due to prices holding steady between the two years or some other reason. Maybe we should just throw in the towel on the average as a proxy for home prices and move over to the median. 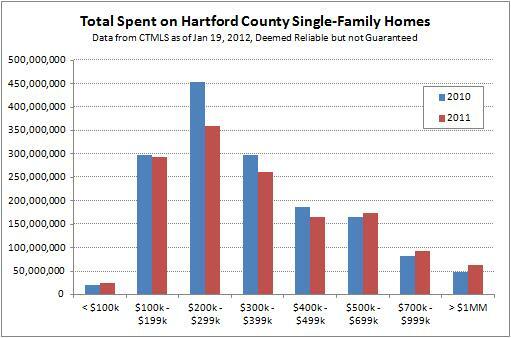 Between 2010 and 2011 the median single-family home price in Hartford County fell 3.3% from $230,000 to $222,500. Or we can just trust our observations of the market … home prices fell in 2011. 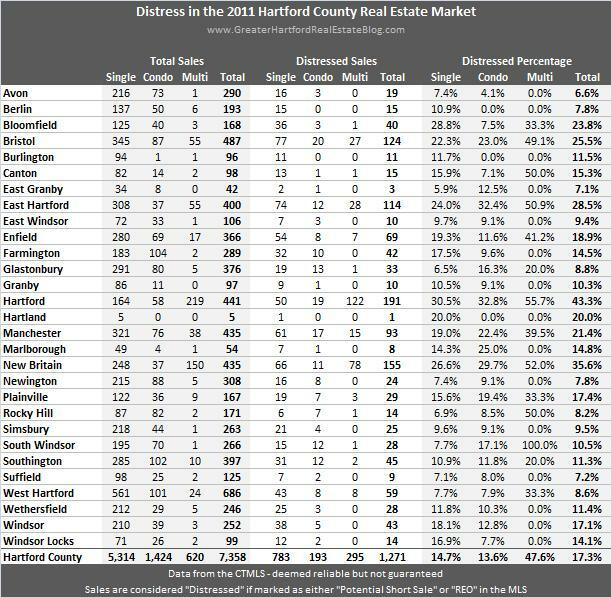 Last year we gathered up all the Hartford County residential transactions since the beginning of the CTMLS in 2000 and showed how the very high level trends had changed over 10 years. Today we update those charts with the data from 2011. As always, the CTMLS is deemed reliable but not guaranteed. The total number of single-family home transactions fell again in 2011, decreasing about 8% from the 2010 total. 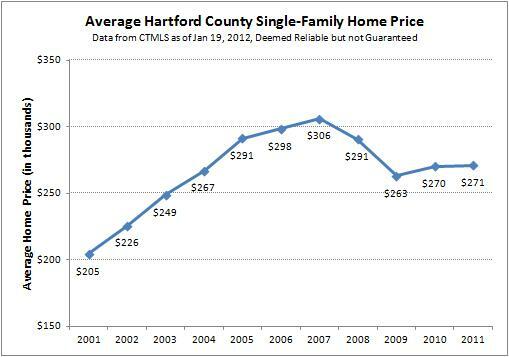 With the latest data point, activity for this type of property is about 41% off the 2005 peak in Hartford County. Last year we wondered whether we had seen a bottom in the number of deals – clearly 2010 was not the bottom. As sales volume fell, showing a decrease in overall demand, the average sales price was apparently not changed. We don’t put a lot of faith in average prices because they are strongly influenced by the mix of homes that sold in a particular year, so we think something else is going on. Our anecdotal experience is that home prices are still falling in all the towns and markets in which we do business. We also see more interest in higher priced homes, which will tend to inflate the average, and believe that’s why the average sale price edged up slightly. We’ll work on building the case to either prove or refute this hypothesis and share that result too. Big picture analysis like this is never especially satisfying since we usually end up with more questions than answers. What are you guys seeing out there as you follow the markets? Michael called 2011 almost perfectly in the comments from last year’s post, so we clearly have knowledgeable readers! 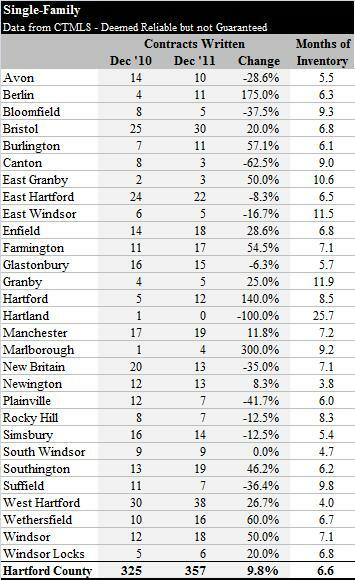 Also, we have this data broken down by every single town in Hartford County. 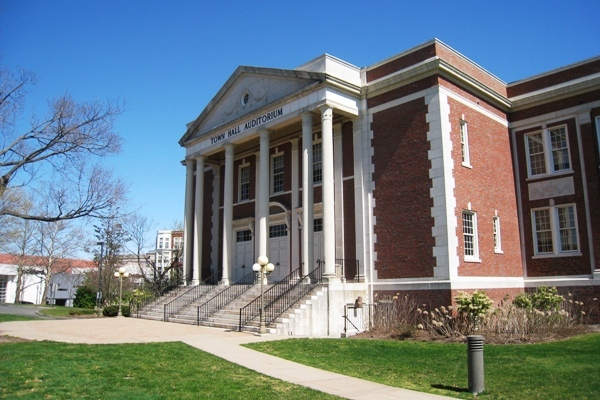 If you’re interested in a specific town, email us and we’ll send you the charts. 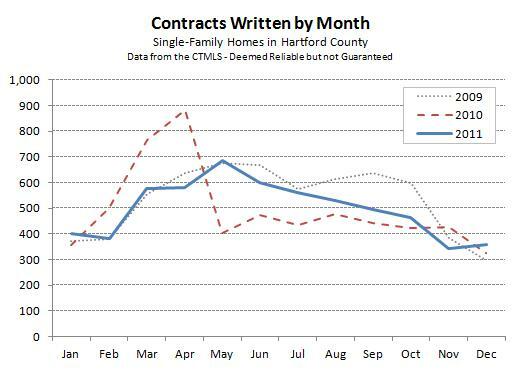 December single-family contracts came in at 357 for Hartford County, which was slightly higher that the number of deals that came together in November. December is traditionally the slowest month of the year, so having it outpace any other month is a bit of a surprise. We think that the usually large snow storm, which was felt through the beginning of November, worked to push some business into the year’s final month. This December also showed an uptick in activity compared to December of 2010. The number of homes that went under contract this past month is nearly 10% higher than the total from the previous year. It’s difficult to know how much of this observation can also be attributed to the snow storm. Our feeling is that it is not a result that we should read too much meaning into. Results were well distributed at the town level, though not over as extreme a range as we have seen in previous months. More interesting is that the number of homes actively for sale has come down to about 6.6 months worth of inventory. It was at 7.3 months in the November report, and peaked at 8.8 months in the June report. Inventory levels should be lower at the beginning of the year. Many sellers take their properties off the market over the holidays so they don’t have to worry about keeping their home in “show condition” and accommodating visits from potential buyers. New listings will begin to come on the market at a steady pace, and the pace will increase as we get through the winter and closer to the traditional spring real estate season. We’re working on our 2012 real estate predictions, and will hope to have some more analysis of 2011 available in the coming weeks.